When beachgoers hit the Ortley Beach boardwalk this weekend, they’ll likely notice the rebuilt crossovers to the sand and the emergency dune that has been restored by crews over the past several months. What’s less obvious – but just as important, for safety – is a new feature: a fence that will run the length of the boardwalk. The holes in the sand where the fence posts will be placed are already dug, and the fences are in the process of being installed. The reason for the fence is twofold, said Toms River Township Engineer Robert Chankalian. First, he said, the township is preparing for the planned federal beach replenishment project that will construct 22 foot-high, vegetated dunes along the township’s oceanfront. The fence will also provide an extra layer of safety while the township is awaiting the project to begin, which will likely be in 2017. In the mean time, storms will continue to eat away at the temporary, emergency dune that crews often work to maintain. The safety hazard has caused the township to close the boardwalk after storms in the past, though in those situations people commonly hop the barricade or caution tape to access the boardwalk anyway. 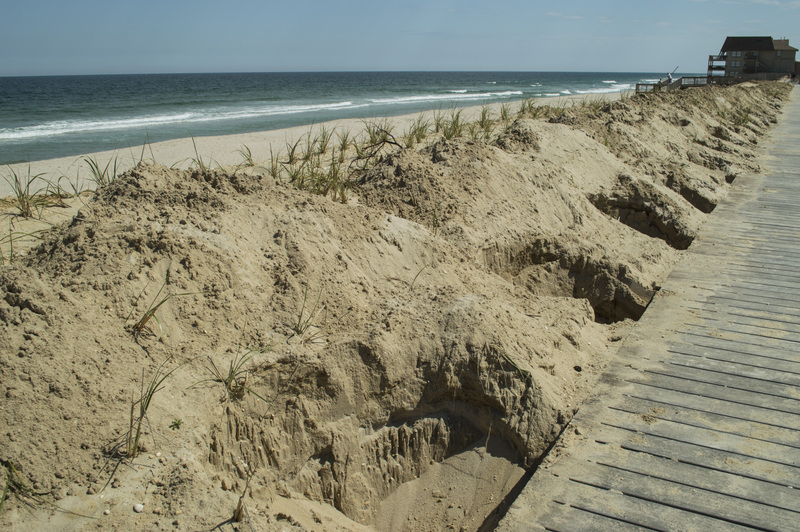 Ken Langdon, an Ortley Beach resident, said he opposes the construction of the fence since he believes it will make it more difficult for the township to remove piled-up sand after storms. “It’s creating problems for yourself,” said Langdon, who suggested the fence be placed four to eight feet east of the boardwalk. Councilman George Wittmann, an engineer by trade, said Chankalian developed the fence plan using “engineering principals” to calculate the safest and best location for the barrier.